Published in the May 2016 issue of Sign Media Canada. In the sign equipment market, there are CNC vendors and there are CNC system partners. The role of the former is limited to simply supplying equipment and parts, nothing more. The role of the latter, on the other hand, is to work with sign businesses for the greater good of the industry. Ideally, such a relationship is what every sign shop should require of each of their suppliers. This is particularly the case with regard to manufacturers of computer numerical control (CNC) routers, which have become increasingly common in today’s shops. The sign business has evolved to the point where traditional supplier relationships are not merely insufficient, but can even be detrimental to a sign shop’s operations and profitability. Not long ago, most sign shops expected their equipment vendors to provide (a) products and then (b) the necessary technical support to maintain those products. That expectation, however, was not always met. 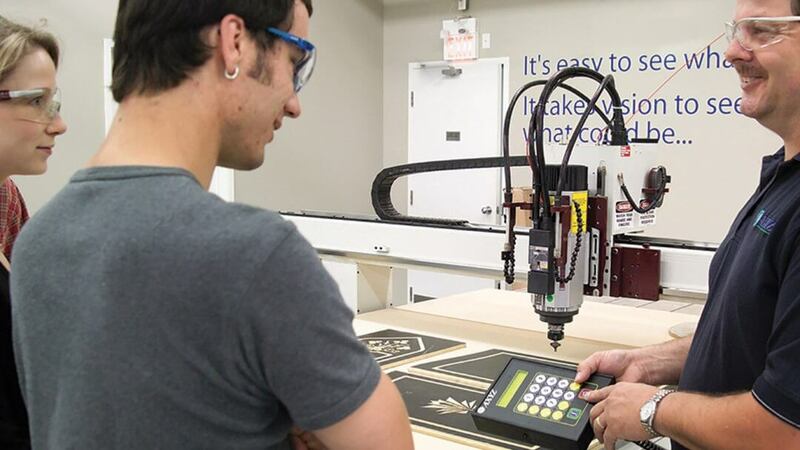 Even now, sign shops that purchase so-called ‘off-the-shelf’ CNC routers often end up having to rely on third-party support for maintenance and repairs. The potential for economic loss is a great threat if such support cannot be provided immediately when a router malfunctions or breaks down. For vendors to be considered full business partners, they need to transcend their traditional understanding of customer-oriented service and develop more comprehensive knowledge of their clients’ goals and processes, while still able to deliver technical support as needed. Well before being ‘on call’ for problems that may arise, they should also have a seat at the table with signmakers for tactical and strategic decision making. As mentioned, the new roles of sign equipment suppliers can be equated with the broader evolution of the sign industry. Not many years ago, the industry was dominated by backlit electric signs, which required much laborious work to create, mostly by hand. The only role for technology at the time was the use of an overhead projector to shine on image onto a wall to serve as a template for the building of the sign. Letters were cut either by the signmaker or by an outsourced third party. The process was time-consuming and costly, especially for smaller sign shops with five or fewer employees. Advanced technology then came along in the form of CNC routers. The trailblazers for this equipment’s development were computer-aided manufacturing (CAM) software in general and toolpath software in particular, which could control cutting tools with a level of precision that old-fashioned signmaking by hand, no matter how proficient, was unlikely to match. As CNC technology continued to advance, manufacturers offered multiple spindles, automatic tool changes and drill blanks. As a result, router operators in small sign shops began to enjoy the luxury of customization, a benefit that previously would have been available only to much larger shops. Another key development in the sign industry, which may have had the greatest impact on the adoption of CNC routing, was the transition from traditional signmaking to digital wide-format inkjet printing. Today’s sign shops tend to digitally print point-of-purchase (POP) graphics, for example, onto specialized substrates before CNC routing them into custom shapes. This combination of technologies continues to grow among smaller sign shops, which have identified an opportunity to attain higher profits by using a digital flatbed printer’s software to design shapes for a router to cut. Even a small shop can enjoy substantial reductions of the time and labour needed to complete a project to specifications and meet its customers’ deadlines. Empowered by sophisticated digital printing and cutting technologies to take on larger competitors in terms of their production capabilities, many of today’s small signmaking businesses aspire to serve as one-stop shops for their customers. And there is no reason they cannot achieve this aspiration, provided they receive helpful guidance—which is where the changing nature of their relationships with vendors and suppliers comes into play. With the current level of competition, signmakers can no longer be content buying from vendors whose products are adequate but whose training and technical support are limited or non-existent. There is simply too much at stake, as CNC routers and other new systems place a greater onus upon each sign shop to create thorough business plans for their use. For such partnerships to succeed, the supplier must understand the complex challenges encountered by the sign shop, regardless of its size. The foundation of this understanding will be a strong familiarity both with the shop’s processes and with how it controls those processes. The loss of process control, on the other hand, is common when cutting is outsourced to a third party, rather than handled in-house. In such scenarios, the sign shop has no choice but to wait until its projects are completed by other companies. To address this issue as part of their strategic decision-making,signmaker should require CNC vendors to help develop a cost analysis, comparing the purchase of a router for in-house use with the outsourcing of such work to another business. With outsourcing, for example, the figures are fairly standard across Canada, with the costs of third-party machine time ranging from $70 to $110 per hour. Assuming an average use of five hours per week, a sign shop could therefore end up paying more than $27,000 per year for someone else’s cutting work. Such statistics need to be weighed against the upfront investment in and running costs of an in-house CNC router. The vendor should be able to provide all of the necessary information for this analysis. Hence the need to go beyond a limited focus on the router’s selling price. Rather, the signmaker should ask for referrals from the supplier, visit facilities where its equipment is in active use and check reviews of product performance. A comprehensive presentation of facts is key to enabling thoughtful and prescient economic decision-making. Most buyers and sellers of signmaking equipment recognize the need for training during installation, but what separates a vendor from a business partner is the latter’s acknowledgement that training needs to continue well after the installation. This is for two reasons: process change and turnover. Every sign shop experiences staff turnover, so the owner needs to be reassured training can be provided for new employees as they join the business. In-house process change, meanwhile, can be especially challenging without ongoing training relating to the equipment used in said processes. Change does not have to be disruptive or detrimental to a sign shop’s operations, so long as the right training protocols are in place. As mentioned, technical support is always a major concern, especially with respect to ongoing maintenance of the equipment. Given how time is always of the essence, remote diagnostics should be in place in case any problems arise. The quality of support offered will depend on experience. signmakers should review vendors’ service records, expertise and reliability as part of their ‘due diligence’ research prior to purchase. Such support should not end after initial training and installation. A shop’s goals may change in a few years’ time, at which point upgrades or additional training protocols may become necessary. It is important to plan ahead for such eventualities. Close business partnerships between supplier and sign shop are integral to the success of both. The relationship should start with a review of the processes and materials the shop plans to use to create graphics for its customers. Then, based on the information collected, the supplier should produce a purchase analysis demonstrating its understanding of the shop’s goals and challenges. While the quality of CNC equipment is certainly important, in the end a router is nothing more than a tool for helping a sign shop do what it does best, which is where both parties’ focus should be. The availability of the supplier-as-partner can take many forms, not all of which require an in-person presence. Making spare parts available as needed, for example, is a worthy program, as are the aforementioned remote diagnostics and, for that matter, ongoing upgrades. Given the rapid developments of new capabilities in CNC technology, it would certainly be unrealistic to buy a router and assume no process- or operation-related revisions will ever be necessary. It is incumbent upon suppliers to provide navigational guidance to help sign shops weather future changes in the industry. That, ultimately, is the point of working with a CNC system partner from start to finish. Learn more about our CNC Routers.